Satire is a lesson, parody is a game: Steel Panther are seasoned performers who parlayed Spinal Tap-ness into a full-time career. Their show celebrates everything that is both praiseworthy and ridiculous about rock music. Charisma by the bucket load, dirty jokes, histrionics, classic rock showmanship--and accomplished musicianship. An enjoyable show regardless of whether the recipient knows the source material. It works on its own merit as the protagonists are smarter than the people they are parodying, which is again a sure sign that less smart people are taking it for face value--which is when the gross yet admittedly funny jokery gets slightly uncomfortable. At least in theory. With Steel Panther even the ones on the receiving end of their over the top misogynist banter seem to be amused, which gives substance to the notion that the more unapologetically sexist characters are, the more women are attracted to them in person. The Panthers' set list included songs from their entire three studio albums, the first of which was on constant rotation in your humble narrator's household after its release, laced with every bit of the rock theatre you missed out on in the 1980s. 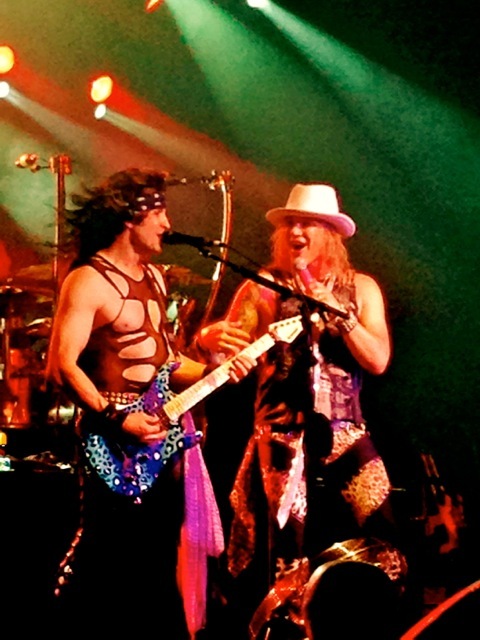 After both the male voyeurs and females exhibitionists of all shapes and forms had ample opportunity to sate their appetites during the Steel Panther set, the appearance of the mere silhouette of the Sunset Strip survivor with the top hat and Les Paul sent the audience into a frenzy. Teaming up with Myles Kennedy, Slash backed by the Conspirators delivers a two-hour "best of set" with songs spanning his whole career, including the occasional round from the Velvet Revolver, a bite from the Snakepit and Gunner thrown in for good measure. Myles Kennedy was refreshingly humble for a lead singer and pulled off the old GNR classics convincingly without changing the style or trajectory of the originals. A solid Sidewave show.